The parade of shortstops that Boston has tried since Nomar left would probably have been a heck of a lot shorter if current Astro closer Brandon Lyon had not flunked a physical during Garciaparra’s last season (2003) playing in Fenway. Why? The Red Sox had made a deal with the Astros in June of that year that sent Lyons and another player to Houston. Lyons flunked his physical. One week later, the Red Sox made retribution by accepting Lyons back from the Astros in exchange for Freddie Sanchez. At the time, Sanchez was considered the top shortstop prospect in the Boston organization. But remember that back then, the Red Sox had every intention of re-signing Garciaparra so they felt Sanchez was expendable. That turned out not to be the case. Freddy went to Pittsburgh and by 2005, he was starting at third for the Bucs. One year later, his .344 batting average won him the NL batting crown. Then Pittsburgh, faced with paying their rising team of young stars higher salaries decided to instead dismantle the team. As the lineup got weaker, Freddie’s production declined until he himself was traded to the Giants, where he helped San Francisco win their 2010 World Series title. 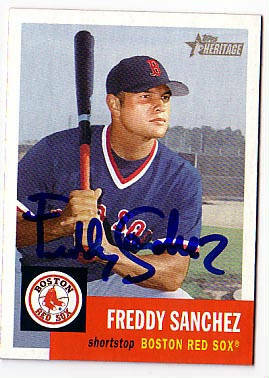 Freddie got into just 32 games as a Red Sox in end-of-the-season call-ups in 2002 and 2003. Since then he has proven to be a solid and versatile infielder and a very effective hitter. If only Brandon Lyon had not flunked that physical, Freddie Sanchez might have spent the last eight years as Boston’s starting shortstop.